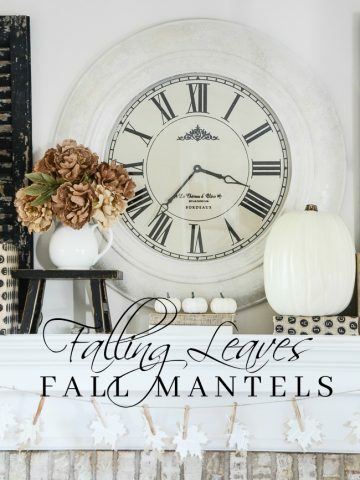 You know it’s fall when the mantel and StoneGable sports white pumpkins and falling leaves! Oh, yes! StoneGable is being slowly transformed and getting ready for a few fall tours in just a couple weeks! I love all the orange and saturated color that fall brings but for early fall I’m showing off the softer side of fall with a neutral mantel. Here’s the spring mantel. I styled it with an easy transition into summer and fall in mind. Instead of recreating the wheel, I just tweaked it! And hung a fun-fun-fun burlap and book page leaf garland! Come back tomorrow and to see how to make this fun fall garland! I’ll be posting a peek here and there of my mostly neutral fall decor in the next week or so. But look for StoneGable’s Fall Tour Part I on September 6th and Part II on September 14th. Did you know you can follow me on social media? Get in on all the StoneGable posting, pinning and shouting-out! Follow me on Pinterest HERE. Follow me on Facebook HERE. Follow me on Instagram HERE. Kathy, so nice to hear! You get me in trouble, buying thin’s to dec. with. I really enjoy looking & reading your Webb. I love the way you decorate. I just wish I had a mantle to decorate. I love your big beautiful clock on the mantel!!! Those burlap blooms are beautiful . Love all of it, especially the burlap leaf garland! Your mantle is so beautiful. That leaf garland is adorable! I really just think the whole this is so lovely. Really like the softness of black, cream, and white. I am using this scheme more since following you. Then all I do is add some seasonal color for a wow factor. I like the way your black shutters are a back drop for the lamp. thanks again! Your blog is full of inspiration, and I love the mantel! I like the neutral style here and how it can go with anything, unlike the typical fall oranges, browns etc. I also went online right after I read how to make my own mulling spice potpourri and bought all of the ingredients which arrived yesterday. Can’t wait to bottle some up in mason jars for gifts! Thanks for all of your Christ centered posts as well, you are a blessing! Your neutral palette is so pleasing to the eye. Great transition idea, as I do not usually change to Fall this early. Am a tad conflicted, since I so enjoy natural Fall decor, but love this look as well. Whites and creams are my calming colors. Just waiting for that first cool, crisp, blustery day. Last year, I painted varying sized orange pumpkins (dollar store & Michael’s) a muted blue then rubbed antiquing medium on top. If blue isn’t your thing and you don’t want the typical oranges/rusts/etc, have you ever thought of soft greens and dark plum colors. Creams and whites could still look nice with any of the above-mentioned colors. Okay, it’s official-I love fall! Bring on the garland. 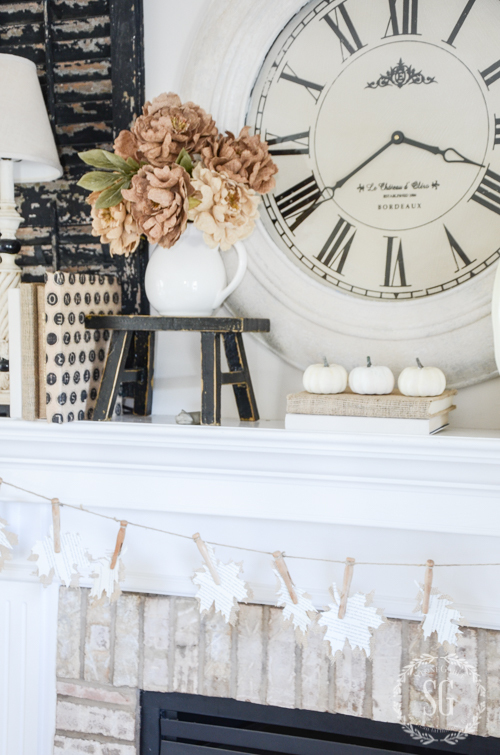 Your neutral fall decor is beautiful on your mantel! I can’t wait to see how to make the fall garland. I kind of giggle. Will we be so bold to post daily in September???. But I do debate on painting a mirror that is brown wood. Back and forth I go. It is in a rectangular set in area above the fireplace. It’s been 15 years but I still like it!!! I do cover it with a book page wreath a friend made at Christmas or add greens above it. I do have a narrow mantle. And the Garland will work perfectly. I have newspapers to use. From years ago. My Dad had saved articles. I think I have some burlap somewhere!!! I like the subtle change from spring to fall mantel. Also love the bookprint garland. I think I would cheat though and use the spring loaded wood clothespins. It would also be easy to change out every other leaf to an autumn color a little later in the fall. Great ideas! Looking forward to Fall, my favorite time of Year. I have a couple of neutral colored pumpkins I can incorporate. Thanks for the Inspiration! Fall is my favorite too,Janette! Love the leaf garland! Am looking forward to the tutorial! Looking forward to finding out how to make this cute garland! Love, love ,love this! Happy Fall,and thank you for inspiring us! Hi Yvonne, I’ve always decorated with a punch of colour in my rooms but i’m really liking your neutral colour scheme with the cream/white, black and tan. I love the Fall look you accomplished with the use of the burlap to add texture. Very inspiring! I love the idea of using a neutral slate to transition into the more vibrant fall colors. The leaf garland is perfect! After the bright summer colors that dominate my decor, this seems so restful for the eye. Love it! Beautiful mantle, great post. Now I need to paint some books and cover some with burlap. It has been on my list and now I need to Just Do It. Thanks for all you do! Your family room is so pretty. I love how you decorated the mantel for fall and I’ll be back tomorrow for the tutorial on the garland. Thank you so much for sharing your beautiful home with us! I love the idea of the neutral colors to slip into autumn. My husband was definitely not into my new love of rustic and farmhouse decor, but once I showed him pictures of your home, he has changed his mind! I hope to collect some wonderful decor pieces through the years, and I’ll keep looking to you for inspiration. Your fall mantle gets the beauty of the season s5arted. Thank you! Your neutral Fall mantle is lovely, Yvonne. I’ve never tho’t of doing Fall decor that way and yet I’m not really fond of orange so this seems like a great alternative. I love the hues in those burlap flowers. So soft and pretty. Did you make them? And those little, bitty white pumpkins are so sweet. I’m getting ideas for how to decorate my buffet for Fall. I don’t have a mantle–boo, hoo! Can I please borrow you to come decorate our mantle!! That’s the one thing I am always so lost on and this is beautiful and subtle!! I absolutely love the garland! It is all very pretty! I look forward to reading your blog each day and looking at all of your pictures! The mantle is very elegant and inspiring…just like you! Wow! My finger go sore scrolling to the bottom of the comments! Yay! Yvonne, your neutral decor is simply stunning and perfect for the transition. Jumping right into all those rich oranges and rusts is a bit jarring… I like the idea of a slow slide into fall. 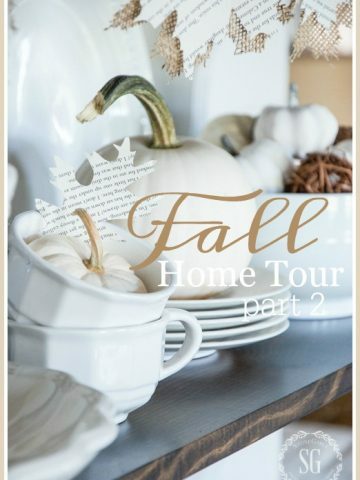 You may know how much I LOVE book pages in home decor… did you hand cut those pretty fall leaves? Love, love, love that fall garland! You are such an inspiration. You have truly been blessed with incredible talent and are so generous to share it with this online commuity. is there a brand and color of paint you use to get the cream and black to look so good togeyher? Many times when displayed together these two colors are TOO harsh. I have so many of my friends about your blog and they your simple recipes and I love your decorating. Beautiful mantle. Love the serene feeling of the white for fall! Beautiful as always, Yvonne! Looking forward to fall. Love your blog! Yvonne, you have wonderful God given gifts ~ Encourager, motivator, leader, mentor, teacher, gracious, and the list continues. What a blessing! I need to get more books out and wrap them in burlap then paint a few shutters. Would you suggest a spray paint for the shutters or using a paintbrush and paint? Would you recommend any specific type of paint? Love your neutrals and your mantel. Everything you share is always first rate. Thank you. Love, love the burlap flowers! This is a wonderful transition while the weather is still so warm! 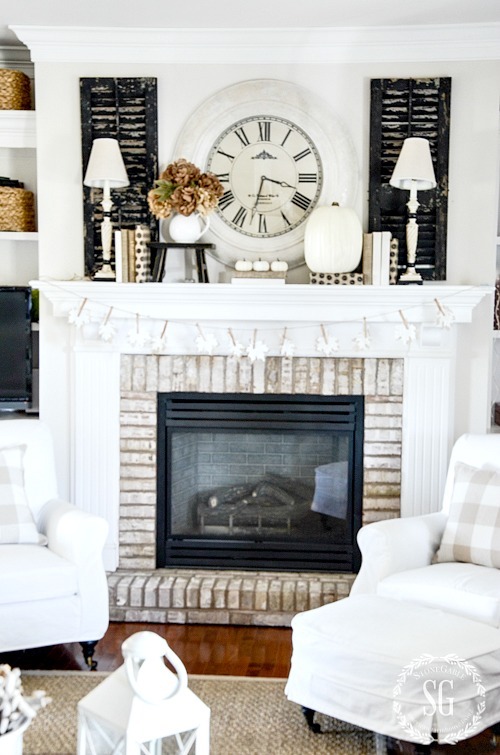 Love your neutral mantel! So elegant. I absolutely love it all! I have recently added small creamy paneled shutters to my mantle & am so happy with the look. Like you, I plan to just tweek my current deco by adding some pumpkins, leaves, etc. I love white pumpkins & have some really good looking faux ones. As fall progresses, I will be adding the oranges, rusts & golds of the season as well. You inspire me with every blog you post! Thank you! Understated elegance, very nice! I also love the burlap & book garland. I might just have to invite a friend over for a wine/craft night. I have some old sheet music that might be a nice alternative to the book pages. Perhaps just give the edges of the leaves a little bit of fall color with some paint? Neutral Fall love! Great decor ideas. doing my mantle this morning and was almost late for work. LOL. I love your style! 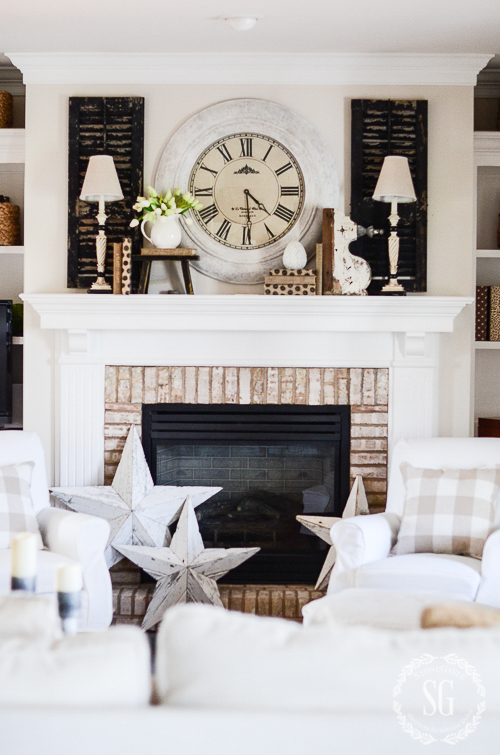 Thank you for sharing how to do a neutral mantle! My living area is very neutral so this would work very nice! Love the neutral decor..so elegant. I love the burkap blooms, the white pumpkins and all of the above. I love your use of the white pumpkins but am wondering about your thoughts on the green ones that I see this year. I started my Fall decorating today, too! I like that garland with the clothespins b/c you can change what they are holding. Very clever!! Gotta make one! Thanks for the ideas. Your home is a beautiful of your talents!!!! Just beautiful! I would like to find burlap flowers too. I can’t find get the look in you post though. Your mantle is gorgeous! Really like your color scheme. I have floor to ceiling brick fireplace. Am considering whitewashing it and lightening the whole room….furniture and all. Your place looks wonderful. I look forward to learning how to make the fun fall garland! Lately I have been loving the simpleness of neutrals too! I don’t think I’ll ever tire of having such a calming and easy look! Love your fall mantle- the burlap flowers add such nice texture and that garland is so cute and clever. I’ve always thought maybe a garland might be just a tad too cutesy for my style, but this one does look so simple to craft I may just try it out to drape on a mirror in my dining room to add that texture that I do love. Another stunning post with a great look! You never cease to amaze! Love how you use the neutral colors for early fall. I’ve been dying to start my fall decorating but thought it was a little too early. You idea of “tweaking” I love!! It’s my favorite thing to do around the house. Everything is about your home looks so natural and comfortable as well as tastefully decorated. So happy I found your website!! Love your neutral mantel. Love your blog! Subtle but beautiful! The burlap flowers add warmth and “pop” and I just love it! I don’t have your wonderful burlap flowers, but I do have hydrangea blooms that have dried to a similar tan this year…the summer heat has really impacted the color.. Headed out to cut some from my bushes and place them in a stoneware pitcher. Thanks for giving me that spark of an idea! 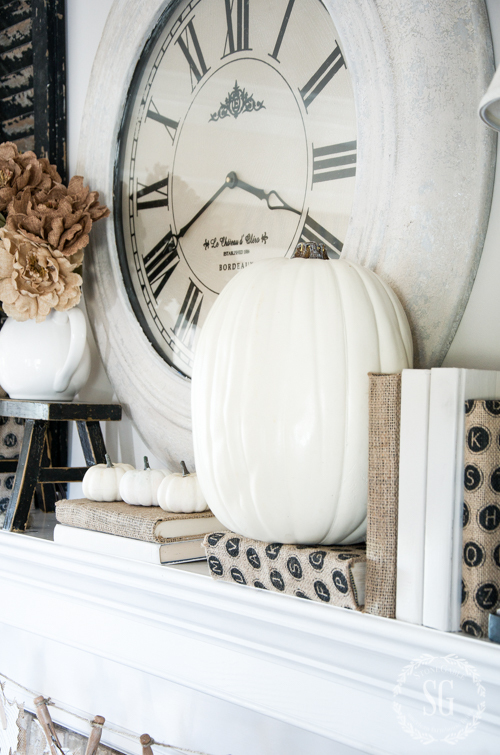 Love your neutral fall mantel, Yvonne, and can’t wait to see the rest of your Fall Tour! You always have such great “magazine worthy” pictures that make your decorating ideas just jump off the screen! Thanks for sharing…..
You inspire me to decorate early rather than late for the upcoming season and get me thinking about what to use!! White pumpkins would work well on my mantle. I have a floor to ceiling dark wood mantle and fall colors tend to get lost and not show up, I will read your post tomorrow on how to do that! Yvonne….absolutely LOVE your taste in decor. The neutral colors are so calming and relaxing yet the accessories have just the right pop of color to bring interest to the room. Your home is gorgeous as is the area in which you are so blessed to live. Thanks so much for all the inspirations you deliver daily to your readers. Just starting to work on early fall tweaks at my house. Not really for full out fall, but making the transition. Thanks for your great idea starters. Such a pretty color combination & I love the burlap flowers. Just spent the last few days putting away my summer decor. Even if the temperatures are still near 90 my inner clock is telling me fall is coming soon. Time to remove the beach theme in the family room and the lemons and limes in the kitchen. I like to use this as a time to clean and dust all those surfaces before creating new vignettes for fall. I think your ideas for neutrals and white pumpkins will be just perfect with the items I already have. Now if the weather cools down a little I can go up in the attic and get them. Have a wonderful Labor Day weekend. I love the neutral fall colors you are using. Giving me new insights to new designs. Thank you! Items to reuse for new projects without spending a lot. I love your blog! You have great ideas and a beautiful home! I especially love your Sunday posts!! 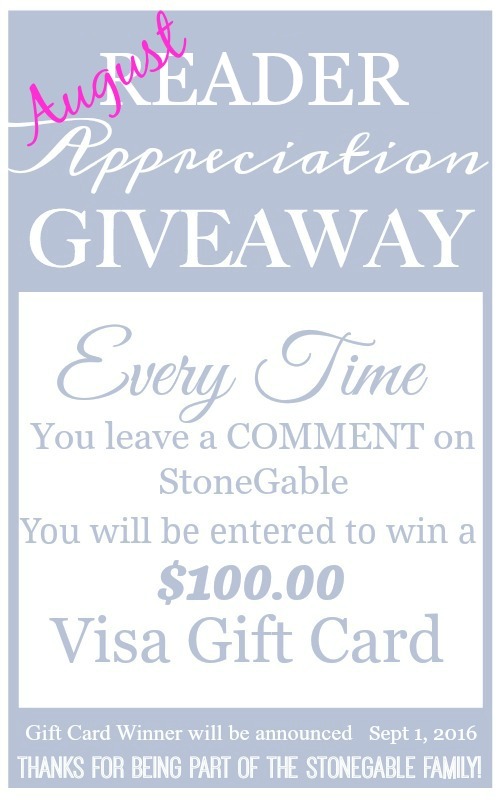 I am a newbie to Stone Gable and I get so many inspirational ideas from you! Everything is so beautiful and your instructions and tutorials are so helpful! Thank you for helping me to make our new downsized home beautiful! Hi Pat, welcome to the StoneGable family! So glad you found us! Love all of the decor and different ideas for the home! Just returned to Michaels to buy more white pumpkins. Great idea!! You always inspire me. I am so loving the serenity of your fall neutrals! Autumn has always been a raucous and rowdy time in my house due to back-to-school, sports events, and a crowded calendar of family birthdays! All the reds, oranges, golds, plus various school and team colors have made my head spin the last few years! Think I will be painting pumpkins and gourds white for sure–wearing Texas WHITE and orange for home games rather than vice versa! Thank you so much for your genteel inspirations! Love, love, love your site. Especially your holiday decor ideas. Love the garland-looking forward to making my own! Am looking forward to tomorrow’s post and the leaf template. Thank you for all your hard work! I’m also glad someone posted about Hobby Lobby having burlap blooms. I clicked on the bloom in “get the look” and unfortunately those are just not in the budget – but do love the look – thanks for the inspiration! Your white and neutral colors are really pretty, Yvonne, but when it comes to autumn, I love the rich colors of fall. Thanks for all you do. I look forward to your blog every day. Love the mantle Yvonne! Love the little black shelf! Your ideas give me so much inspiration and what I enjoy is the fact that they are “do-able” for the average homemaker like me. Keep them coming as I love seeing your creativity. Next August we should have Blogger Appreciation Month….I truly appreciate the thoughht and effort that goes into each of your posts. After a bright and colorful summer. The neutral palette is calming. It looks great. How pretty your mantle is!! Just enough and not too “busy” with all the bright Fall colors one usually sees. You always have such great taste in your decorating. The burlap blooms are so nice. Always enjoy your blog. you posted! The garland is very nice as well as the old fashioned wooden clothespins! creativity in a classy way? I really enjoy the concept of easing into fall décor. I’m gradually adding little fall touches here and there in my own home. What a gorgeous mantle! I love the soft, neutral colors that are so relaxing to look at. Next I’m going to check out your instructions for the burlap blooms. I might try making some for my own fall decor. I adore the white pumpkins too–my can of white spray paint is ready and waiting! I love the burlap books. Love the fall mantle, white pumpkins look awesome. Hope you don’t mind if I copy it all. Beautiful way to ease into Fall. I love the white pumpkins. Very pretty neutral fall mantle, nice and cool while it’s still hot, yet not summery. Wonderful! Stunning! You are such a wealth of ideas and inspiration. 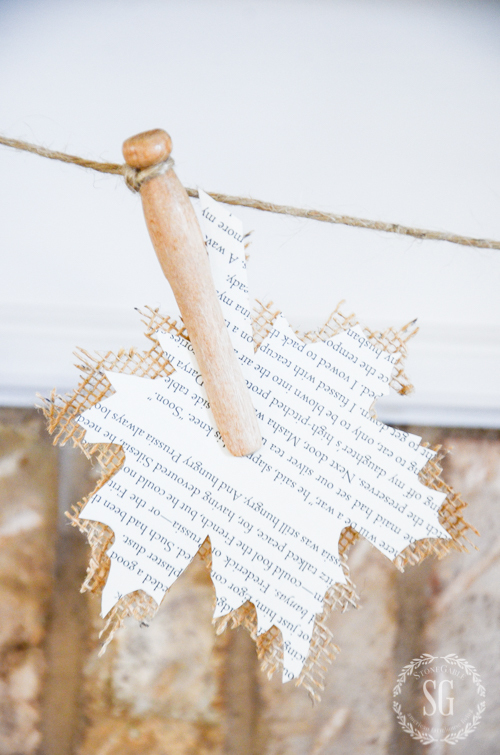 I can’t wait to read you blog tomorrow for the instructions on the adorable leaf garland. Thank you for all you do, Yvonne! LOVE the burlap blooms!! Where did you get them? Beautiful neutral look! Thanks for sharing the softer side of Fall!! Those bright fall colors get tiresome after awhile…what a great way to begin decorating for the season with the softer side of the color spectrum. 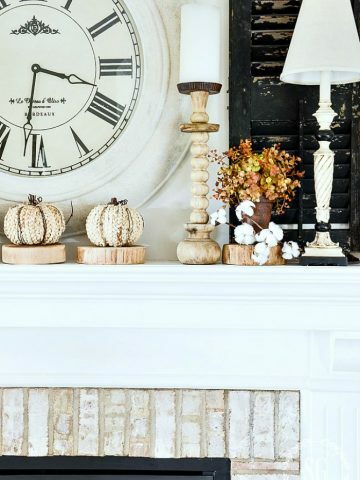 love love love the fall neutral mantle. Great inspiration for my home this fall. Thank you. What a beautiful way to transition into Fall!! Thank you for all of your kindness and generosity in your posts!! Neutrals speak to me no matter the season. I don’t have a fireplace so will be using the inspiration for my buffet and touches in other areas. Thanks! Looks like I need to head out and buy some burlap and tiny pumpkins, oh and twine. I love the look for early fall! You are so clever and creative. Love your blog. A beautiful mantle, it inspires me to begin decorating for Fall! I Love the neutral fireplace decorations. Where do you get your fall leaves that I saw in a bottle on another post? What a charming mantle! I especially love the sweet garland..think I know just the place for something like that in our space. Thanks for all the fun ideas. I always look forward to your posts. I too am going neutral this year! Great taste! I love your fall mantel. Your home is gorgeous with all the neutral colors. I share a passion of white dishes with you. I enjoy your blog everyday and I am alway looking for mantel ideas. Love fall. It is my time of year. Love all of your decorating. 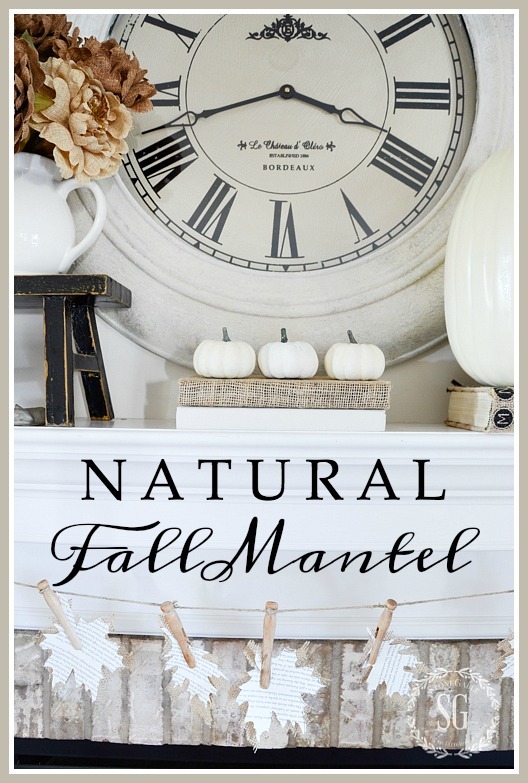 Beautiful mantel….helping me ease into Fall. Still very summer like in So Cal. Did you white wash your bricks on the fireplace surround? If so what product did you use? Reading your blog is like receiving a daily beautiful gift! I like the “Get the Look” section but I sort of looked past it until I read the comments. Your photos are beautiful eye candy! These neutral colors make for a very warm and inviting mantel. It is perfect for adding other color touches like spicy orange and warm green as the fall unfolds. Love it! Love this beautiful fall mantel. Love your style! Getting ready to start taking out my Fall decor. I love all your designs! But I’m most impressed by the fact that you always consider tight budgets. I’m making the clothespin banner for fall! I can’t wait to get started! I love the white Baby Boo pumpkins! I grew them this year in my small garden, and have about 40 or so to use all around. They are such different sizes! I did paint some last year that I will pull out soon! Trying to get all of my seasonal items organized into tubs where I can easily spot what’s inside. I took one of your ideas about using clear tubs and it does make all the difference! Love coming back to your site over and over again for inspiration – for the home and for the soul! You continue to inspire this decorating and cooking challenged woman. Also, love that you are so faith filled, another source of inspiration! Love the quietness of this neutral transition! Sometimes I just need to “declutter” the sensory overload and enjoy simplicity! Think you have definitely accomplished this! Thanks for inspiring all of us! Love the leaf garland and the neutral colors! Love the fall mantel, very calming and beautiful. Hope you have an amazing holiday weekend! Love your soft use of colors on your beautiful mantle.Pinned it so I can try to copy! I never did like those bright orange colors for fall. used sparingly they are just OK but much prefer a more natural look. Love it!!!!! Your mantel is so pretty and just the right tones for fall. I love those burlap flowers! I do love this softer side of fall look and I love how you just tweaked it! Great job!! Love the fall season, it is my favorite! Your ideas are fantastic and I will be using some of them. I decorate inside and outside. The colors of orange, red, brown, yellow and gold are so beautiful they make my heart happy. Have a great weekend everyone. 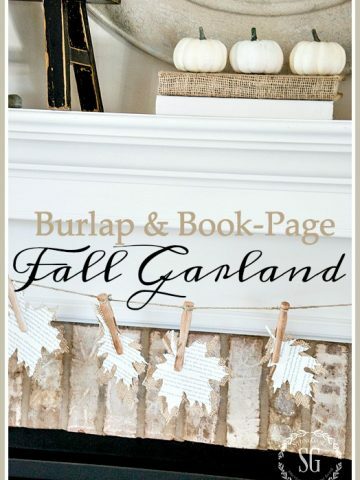 I’m so happy to see your lovely neutral fall decor and especially love the burlap and book page leaf garland! The traditional fall colors just do not pair well with the color story in my home. Thank you for your inspiration and am looking forward to the tutorial on the leaf garland. I am not crazy about orange, so I think this look is lovely. All your projects come out beautiful! I love your fall mantel! I so wish that I had white everything, but didn’t have the foresight. The neutrals are so beautiful but I can never resist adding a few bright pops of color. Can’t wait to see how you incorporate color as we get closer to the fall. Your mantle looks onderful! I’m looking forward to the template! It is so easy to see the love you have for your home in your decorating style. I think it is beautiful too. Sometimes I miss the richness of that clock before you redid it. Wish the space over my mantle could handle it’s size?. Happy fall Yvonne. Me too, Judy, but I was hesitant to say anything in case my opinion was taken as criticism. 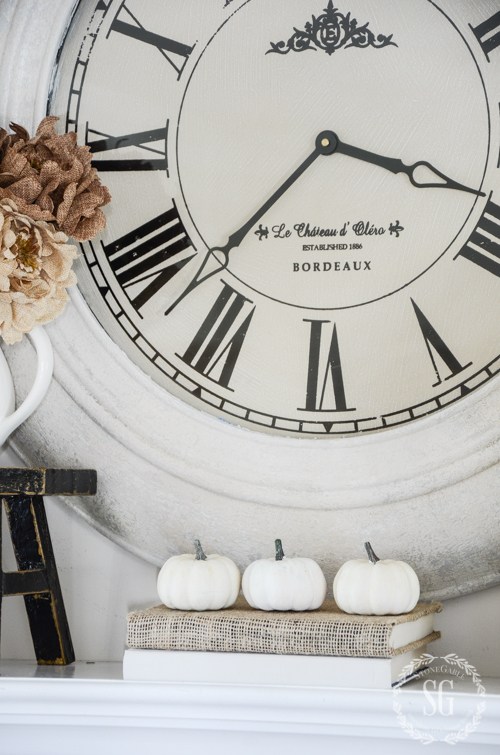 While I love all of Yvonne’s ideas, I loved seeing that dark clock with the shutters painted white. The dark color, to me, looked richer and more expensive. Love how you incorporated shutters into your mantel vignette. Gives me inspiration to paint some cast offs! Yvonne ,you are such a great sorce of ideas and inspiration. 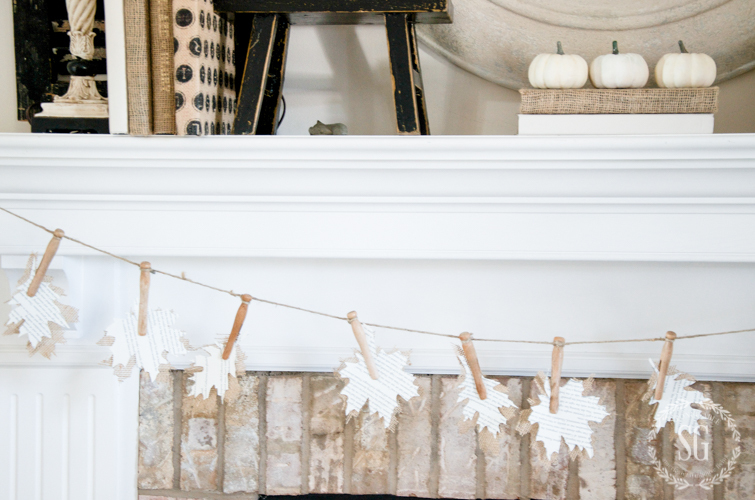 Love your little leaf garland hanging from the mantle in your family room. Have a great day and am looking forward to your post on how to make the leaf garland. I think I like the burlap flowers best. It’s all quite lovely. I don’t have any of those flowers and they are great. They are like the dried hydrangeas – they work so easily. I really do enjoy your blog. Love the white pumpkins……perfect for early Fall! Love it all – but the garland gave me a super jumping off idea for centerpieces for our fall festival ! Yes, 25 tables made easier. Hugs and Happy (nearly) first day of September. Let us embrace Mother Nature’s lovely world as she begins to slowly change out her wardrobe. Hi Patti: if you’re having to decorate a lot of tables, have you ever made garlands from silk leaves? Buy a bag from the Dollar Store, thread a large-eyed needle with a Fall color (brown or rust) yarn and just join the leaves with a running stitch. (Just one stitch at the top of each leaf.). Or you can use glue but the yarn is faster then you tie the ends of the yarn (holding the garland) around a nail at each end of the table OR you could just scatter leaves on the tables. However, I know Yvonne’s garland will be lovely and fun to make! Thank you for all the hours and days you put into a single post! Now and then, I might add a few new blogs to my reading list but always “unsubscribe” as I find them too difficult to navigate. I like that I can see the WHOLE photo when scrolling down reading your daily post. There’s one blog I subscribed to on Sunday but by Tuesday, I had unsubscribed as it was too difficult to view. I don’t know what the computer term is for where your name and categories is (the part that has your ticking and bird’s nest) but one particular blogger has that part block a good half of my screen. No matter how much I scrolled down, that “header part” block the viewing. To read anything was like trying to peek under a “blind”! I just gave up. Other blogs tend to flicker constantly and are annoying. Anyways, I apologize for this lengthy spiel but just wanted to say “thank you” for your hard work and devotion! I love the neutral colors of your mantel! It’s very understated & classy. Are those small white pumpkins faux. We haven’t seen any real ones here in Easton, PA. I have always leaned to the traditional fall colors but your ideas are beautiful. I have always leaned a bit more to the neutral or muted fall colors and this is right up my alley! Thank you for sharing! This is one of my projects for the living room. I would like a fireplace with shelving on each side. I love this look. I also looked at one of your old postings of the Indian Corn Wreath. That’s one of my projects for the Fall Season. I love Indian Corn. Thanks for your site I always see something that I love. I can’t believe today is the last day of August!! What??? Pretty mantel Yvonne. I have a few of the burlap flowers. Can’t wit to get them out. Love your neutral but interesting mantel. I found a pair of shutters at the restore for a $1.50 and have them framing a mirror on my mantel! Thank you for all your inspiration! Your mantel looks awesome!! I really love the leaf garland it is very cute. Love the mantel! I agree, neutrals are a great way to ease into the Fall season. And with a neutral base you can add and change out pops of color as we move deeper into Fall and Winter! Love it! Yvonne, your mantel is gorgeous! I am so looking forward to Fall and the cooler temperatures! I hope that you have a wonderful day!!! Love your neutral mantel. Who would have thought fall can also include neutral colors. The burlap flowers are amazing. The black accent gives the right pop. I still prefer the autumn colors more, but you always have that magic touch! Love the leaf garland….so cute!!! Hurry up Thursday! I can hardly wait to make the fall garland, it’s adorable. I’m not a traditional fall color gal so thanks for the neutral ideas. They work perfectly for me. 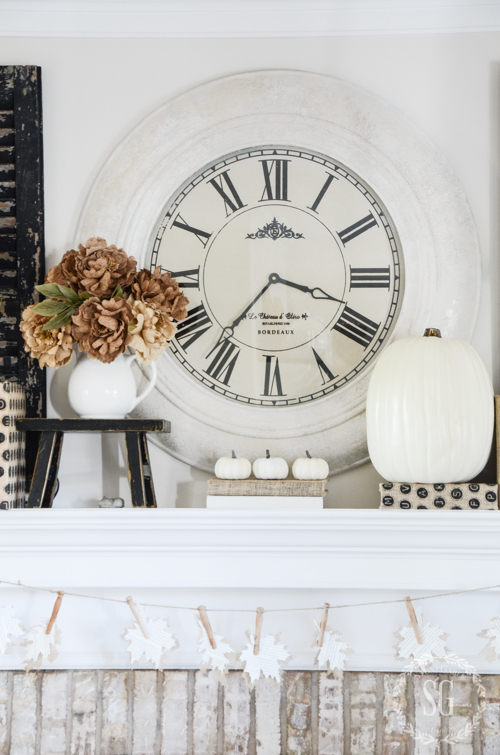 Love your fall mantel. I’ve got to get some of the burlap flowers, they look so fresh and add just the right amount of texture. When do you think fall decorating should begin? I agree with Yvonne on this “timing” question, Sharon. It all depends on you, where you live and your weather conditions. Even though we’re entering into September, it’s still hot here (southern Ontario) and I find orange pumpkins look a bit silly when I still have the a/c running! Last year, due to some decor changes, I found orange too vivid so I painted my orange pumpkins a muted blue then rubbed on some umber (brown) paint which has given them an antique look. I’ve added some books to the mantel, some blue agate pieces that are so versatile for ANY season plus Fall grasses, etc. and packed away the shells, coral and glass floats, etc. I decorate early for every season so my wonderful readers have an opportunity to see something for the upcoming season. If I didn’t blog I’d probably start decorating for fall right after Labor Day. But that’s just me. I think you should decorate when it works best for YOU! I love the forethought of your spring mantel! Just a few tweaks here and there and it looks perfect for the next upcoming season. Looks fresh and new with simple changes – a big outcome with little work. Beautiful! Love your leaf garland best! Can’t wait to see how to make the garland -I’ll be back tomorrow with my burlap and book pages ready to cut! Oh my goodness! What a lovely blog! Love your attention to detail and photography is amazing. I really enjoy your topic choices and especially love that you add Scripture! Many Blessings. are the tiny white pumpkins real or faux? i cannot tell!! one of these days, i’m gonna cover me some books in burlap, just you wait and see… i may even have a burlap book party and invite friends, ha! What did we do without white pumpkins ? Your mantel is beautiful and inspiring. I also like the leaf hanging which is something I could do! A few years ago I grew Baby Boo white pumpkins in my garden. They did so well, but they took over most of my garden boxes. Maybe I’ll grow them next year! Since we’ve downsized our home, storing decor items is an issue for me. Keeping the basic elements of a vignette and changing just smaller details works well with my limited storage. 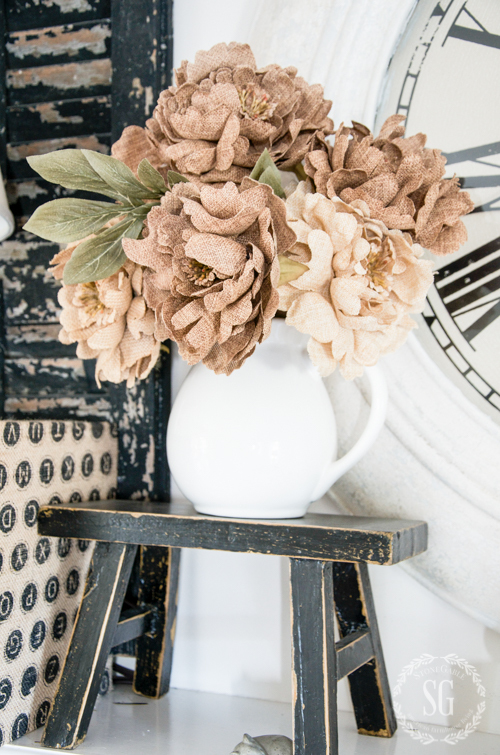 The burlap flowers are a delightful new way to add texture and visual interest. Now I need to learn how to paint a few orange pumpkins white! Hello Patricia – I’m in the same boat – moving from a house (with a basement) to a condo. I’ve loved decorating since my early teens and thoroughly enjoy changing things around all the time – especially as the Seasons change. However, storage is now a huge problem. Re painting pumpkins – I had some orange Dollar Store ones plus more expensive ones from Michael’s and both kinds were easy to paint with ordinary craft paint (DecoArt, Americana, etc.). You might need two coats (or maybe three) but the cheaper paint works! I painted mine a muted blue then when thoroughly dry (I waited one day) to let the paint “cure”, I lightly rubbed on some umber (brown) paint to “antique” them. I hate to boast, but they look amazing. I was pleased to discover I didn’t need to buy the more expensive chalk paint! Hi, i actually used some leftover satin wall paint in a creamy white to paint those dayglo orange Dollarstore pumpkins. Two coats, then a little wax and i have to admit they look as good on my porch as the costly ones…..
Yvonne, another beautiful update to your lovely home! Cant wait for the garland tutorial. I’m very pleased with mine too, Jae. A recent visitor thought my craft-painted pumpkins were antiques decor pieces! Ha! Patricia, stop back tomorrow. I’m sharing how to do just that! I love the big clock as the focal point and the way the shutters are a backdrop for the lamps. Your neutrals will work very well for this time of the year. Photos are professional. So sweet of you to think so Elizabeth. Thanks! I love all the light colors, its very pretty. I can’t believe that tomorrow is Sept ! That is SO cute!!! I love the garland. Love the burlap covered books and the flowers. I love it all! I love the white pumpkins… I think these are the kind Cinderella would have chosen for her coach! Very soothing fall mantel. Lovely as always. Hi Yvonne! Your mantel is looking gorgeous as always! I’m still so impressed with how your clock turned out when you painted it. Those burlap flowers couldn’t look anymore perfect up there too! 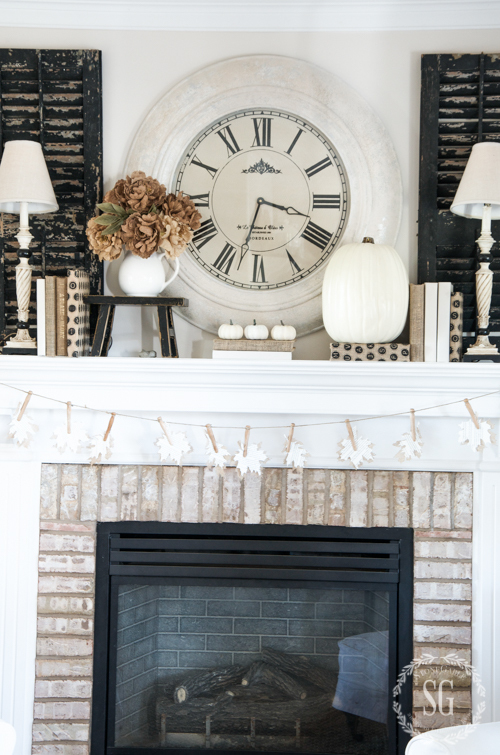 Love Love love the neutral and fabulous fall mantel and your beautiful room ? I love your decorating style! I really am in love with this mantel! Subtle, elegant, and beautiful! TFS! Love love the softness of the room. I’m a very fickle person…I love the softness of neutral colors….but also love vibrant colors. I’m right there with you Marty! Very pretty mantel… Love the transition! Beautiful! I love the burlap blooms! Where did you get them? Marie , I recently bought some burlap blooms at Hobby Lobby to “get the look” and they were a more reasonable price. Hope this helps. See the “GET THE LOOK” in the body of this post. You can click on the flower and it will take you to a site to see them. They are an investment, but will last for YEARS! I was also wondering about the burlap blooms, but I’m not seeing “Get the look” in your post. I’m sure it’s in bold print right in front of me. ? 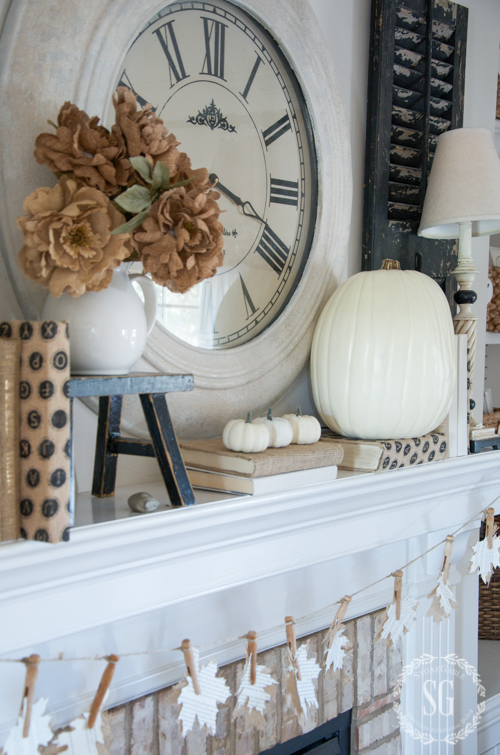 A beautiful neutral fall mantel! So crisp and clean! The addition of the color black makes everything pop! Can’t wait to see how to make that fun fall garland! Love the white, black and tan color combo. What a cute garland with jute and wooden clothes pins, I think I am going to borrow that idea to use. I have all the supplies needed to make it. I love all the burlap also and the white pumpkins! Great job. Love the clock, but I don’t have anything like that piece, what a show stopper it is! I’ll have to rummage through my things to find something similar in scale to use. Stop back tomorrowGin. I’ll have a leaf template for you too! Truly adore your style! I actually bought your exact Ballard Designs Dining Room Rug after seeing it in your blog! Thank you so much for all the inspirations for us ” decorating junkies” lol! Beautiful! I love the idea of starting out with neutral fall decoration!! This works perfectly for the still very hot South. As the weather starts to cool, then I could add those beautiful fall colors. Once again, Yvonne, you have inspired me!! That is exactly what I am doing, Melanie. As October and November roll around, I’ll be adding more real pumpkins and saturated color. Yvonne, This mantel is gorgeous! The white, cream and black look so elegant together! I’ve always loved your tiny black shutters and am on the lookout for something similar! Hi Kelly, If you can’t find black shutters you can buy some and paint them yourself.